Not a lot of things move quickly in the turf care industry but one career which has moved rather swiftly is that of David Withers, a former product demonstrator, who has gone from regional sales manager to president of turf maintenance equipment manufacturer Jacobsen in under 20 years. David Withers’ career path at Jacobsen and later at Ransomes Jacobsen has given him a real insight into the global golf and grounds care markets. He joined Jacobsen as a regional sales manager in 1992 at their UK base in Kettering in the UK, and just three years later he was promoted to national accounts manager, a new position that Withers looks back upon with fond memories: “In 1995, the company gave me the opportunity to create a new role as national accounts manager, a position that although big in the US, had never been tried in the UK. The role was created around the same time that we took on the distribution of Iseki, so we were restructuring Jacobsen anyway to accommodate the Iseki guys coming in and decided to setup the new role of national accounts manager. Following the merger of Jacobsen and Ransomes in 1998 ­­- after the acquisition by Textron – Withers relocated from his home in Kettering to Suffolk, and took over the role of UK sales manager at Ransomes Jacobsen. But after only two years in sales and marketing, Withers rise from regional manager to head man was complete, after he was appointed as the company’s managing director in 2004, and in October 2011 his career culminated with the promotion to president of Jacobsen in the United States. It’s a step which has meant a move to North Carolina, for the banking city of Charlotte is where Jacobsen is based. Jacobsen has always taken its corporate social responsibility seriously, especially when it relates to the environment. In this exclusive interview for turfmate, David Withers, President of Jacobsen, reflects on his company’s environmental credentials, the golf industry, and his support for the Golf Environment Organization (GEO). Jacobsen was a founding partner of the GEO almost a decade ago and Withers remains just as passionate about his company’s support for the GEO’s principles now, as he did back in those early days. turfmate: Corporate Social Responsibility is seen as increasingly important for big business, but it’s all about ‘Walking the Walk’ as well as, ‘Talking the Talk.’ What are the key responsibilities for businesses of all sizes in this regard and what practical measures can they take? “Sustainability is an important issue and an opportunity for best practice in the business arena – and Jacobsen takes that very seriously. There are numerous practical measures that can be taken in this respect, but for us ISO14001 accreditation, the international environmental management standard, has been one of our main drivers. We are still the only manufacturer in this industry to have achieved this; it’s not easy for a manufacturing business, but I was determined that we would target this as a business goal because, long-term, I knew it was right approach to take. “Obviously, as a manufacturing company, we generate significant amounts of waste material, be it steel, plastic, fluids or cardboard, but we recycle a highly significant amount and try to increase this year on year. And, in some areas, specifically the UK, we can offer a recycling programme for old equipment, which we call ELMO (End of Life Mowers); we will collect old mowers, tractors, golf cars, utility vehicles and ATVs at the end of their useful working life and recycle them, free of charge. They don’t have to be vehicles we have manufactured; they can be from any provider. “We use biodegradable hydraulic fluids in most of our golf products and we have introduced the first riding golf greens mower, the Eclipse 322, which is totally free of hydraulics and uses electricity as the primary power source, generated on the fly by a small diesel engine or stored in a battery pack. 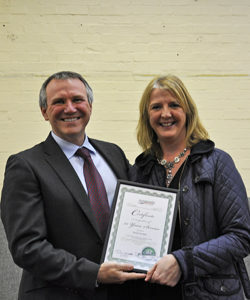 “We are co-sponsors of the UK’s STRI Environmental Awards, and have been for many years. Local to our European manufacturing plant in the UK, we are involved with Suffolk: the Greenest County initiative, which promotes environmental best practice across the region and our three-hole par 3 course, the RJ National, was one of the first golf courses in the UK to receive GEO certification and has been recertified after three years. turfmate: Is there a clear business case for companies investing in the environment as a key component of their business model, and, if so, are the benefits qualitative and/or quantitative? “I’m not sure most people would look at sustainability as an opportunity to improve business or products, but it can. For example, the Eclipse 322 mentioned earlier, when fitted with the solar panel has allowed us to improve the sales potential of this innovative riding greens mower. “In addition, it has improved the functionality of the machine by giving it an extended usage period. Whereas in the all-electric version it might get through 11 or 12 holes, with the addition of the solar panel feedback from users tells us they are able to cut all 18 holes. And by harnessing solar power we are using an extremely sustainable energy source. turfmate: How has the Jacobsen’s approach to sustainability changed over the past 20, 10 and five years, in product design, in staff recruitment and training, in standard operating procedures, etc and has it reached the stage where ‘green’ policies are now part of the company DNA? “Twenty years ago sustainability was hardly on the horizon, but in the last 10 years our business has embraced this as demonstrated in my previous answers. “We are designing products that produce fewer emissions; we’re using more recycled materials and we’re also investigating alternative power sources, such as lithium-ion batteries. We were the first manufacturer to introduce a diesel-electric hybrid mower, dramatically reducing fuel consumption. “To maintain our ISO accreditation we have to manage the business in a responsible way, so our standard operation procedures have changed dramatically. In terms of staff, we now have a waste control officer, dedicated to reducing and recycling waste and that’s a position we would not have had 10 years ago. “All staff are trained to recycle as much as possible, all types of plastic – from drinking cups to plastic packaging used in the manufacturing processes, paper, cardboard and the waste metals and fluids from our manufacturing activities. We have installed energy-efficient boilers and motion-controlled lighting to reduce energy costs and waste run-off water is collected in an on-site reservoir and used to irrigate our golf course. turfmate: GEO is slowly but surely attracting a portfolio of leading global brands and Corporate Partners – Rolex, UPS, Jacobsen, etc; what would you say to encourage others to join the movement? How about us in this part of the globe? 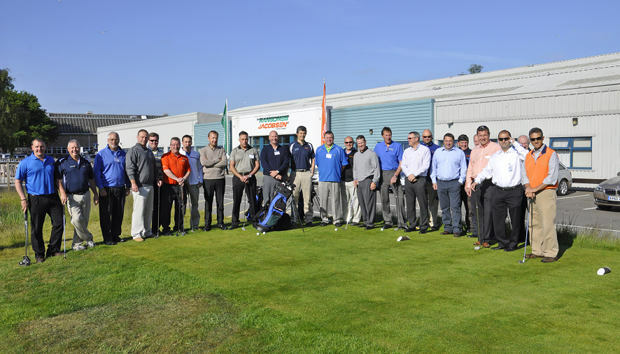 “For golf, Jacobsen is dedicated to being a long-term investor in GEO’s solutions for the industry. We’ve been involved with GEO for many years, right from the start when it was known as Golf Environment Europe and Jonathan Smith came to me with a proposal for support. At that time, and to a lesser extent today, golf had a poorer public image than it deserved and as an industry we needed a collective effort to try and put across the environmental benefits that golf can bring. “We were the only company that supported GEO and Jonathan back then and we continue that support to this day. We were like minded and still are, so I would encourage any business, large or small, to get involved for the greater good of the industry. Golf courses can be oases for wildlife; you only have to look at the biodiversity our short course has introduced to an industrial site in the UK! “We all have a vested interest in the success of golf as an industry; we should all be concerned for our natural and built environment, so I would say that it’s almost a duty for businesses associated with our industry to support the aims and aspirations of GEO or similar organisations. turfmate: At the sharp end where Jacobsen have machinery at golf clubs and courses, is there now a willing acceptance that sustainable turfcare and groundsmanship is not just the best way, but the only way forward? “Yes, in some instances; but there’s a long way to go. Those that embrace the proposition really want to run their clubs in a responsible manner. For instance, look at Hillside Golf & Country Club in Finland who, incidentally, have recently achieved GEO OnCourse accreditation. In 2010 they operated 27 holes, which increased to 36 holes in 2011. Through the introduction of environmental best practice, such as electricity generated from renewable sources they have reduced their electricity costs by 14,000 Euros a year (from 52,000 Euros in 2009 to 38,000 Euros in 2012). By changing their fine turf management programmes they have reduced total fuel consumption (diesel and petrol) by 5,500 litres and saving a further 3,000 Euros in the process. Water consumption has halved and fertiliser inputs have been reduced significantly. turfmate: Could legislators do more to further incentivise designers, landowners, facility managers, maintenance crews etc, and of course golfers themselves, to not only ‘Think green,’ but also to, ‘Act green,’ too? turfmate: Environmentally-friendly sport has now gained considerable traction, and, with business interests in all outdoor sports where turf is the primary surface, where does golf sit in relation to the others? “Without doubt golf is leading the way and is in a reasonably strong position at present. Other sports will have to follow suit and consultation with the GEO would be a good place to start. “Do we need a generic sport eco label? I doubt a ‘one size fits all’ approach would be manageable, but golf could certainly take the lead. It will take a lot of goodwill between the various sporting bodies to bring this about and would certainly be a challenge. But that’s no reason not to try, especially if the will is there. turfmate: Europe and the USA are the two leading continents in taking sustainable golf seriously. How can golf’s emerging nations and territories, e.g., China, India, Korea, Africa, Turkey etc become fully-engaged with GEO going forward. “As a global business it’s as important for Jacobsen to back sustainable initiatives such as the GEO OnCourse and Legacy programmes, not only in the developed golf areas but also the developing ones. I think it was significant that the GEO chose the Beijing Golf Show in March 2012 to launch their sustainable development guide for new golf facilities and renovations, which had also been translated into Chinese.